Ładne mieszkanie 2 pokojowe, położone w popularnej miejscowości Marina Duquesa ze wszystkim można sobie życzyć w tym długie, piaszczyste plaże, szeroką gamę popularnych restauracji i kawiarni. Łatwy dojazd zarówno od lotniska w Maladze, a Gibraltar lotnisko (50 min i 25 min jazdy samochodem). Nigdy nad zatłoczonym idealne na rodzinne wakacje i święta golfa. Mieszkanie zostało zmodernizowane niedawno, przy zakupie nowego komfortowego apartamentu w salonie oraz luksusowe łóżko w sypialni głównej. Łazienkę z sypialni 1 z wanną i prysznicem, wc bidet, umywalka. Łazienka nr 2 ma kabiną prysznicową i umywalką wc. Uwagi na temat zakwaterowania: Ten apartament utrzymany jest w idealnym stanie i chcielibyśmy myśleć nasz gość doceni ten dołożyć wszelkich starań, aby utrzymać te wysokie standardy, podziwiając ich pobyt w Duquesa. Na zewnątrz: Kompleks posiada 4 baseny, pięknymi ogrodami, bezpieczeństwo 24 godziny na dobę i bezpośrednią ocenę na dużą piaszczystą plażę. Na balkonie można cieszyć się popołudniowe słońce podczas relaksu przy lampce wina i ulubionej książki. Pomieszczenie gospodarcze: Pomieszczenie gospodarcze z częścią maszyny do mycia i przechowywania. Tynkarz / Ręczniki / Pościel / Pokojówka: Ręczniki i pościel są zapewnione, a może być zmieniona raz w tygodniu. Sprzątanie może być organizowane na dłuższe pobyty. Inne: Ładna sala sposób z prasą przechowywania i deska do prasowania, a niektóre gry w piłkę. Just came back from a weeks stay at this apartment. It is lovely, clean and fully equipped for a self catering stay. The apartment is literally 5 minutes walk into the beautiful port where there are plenty of lovely restaurants and bars for your enjoyment. The one and only negative I would say is that the apartment is almost next to a busy road, which was quite noisy even throughout the night but that certainly didn't spoil our stay and I wouldn't hesitate to stay again. Richard the owner was very good on responding to any contact you had with him and can I also say that Linda and Paul who manage the property were brilliant to. Meeting and greeting us when we arrived and showing us around the apartment. Thank you so much Richard for letting us stay at your lovely holiday home, we had a great week. Hi Dawn, so glad you enjoyed your holiday last week and everything went well. It's always nice to hear back from our guests with a positive view of the apartment and surrounding area. Thanks again Richard. We are a family of four (Kids 3 & 5). Its our 2nd time in this apartment, we loved it, we stayed 9 nights last year and came back for 2 weeks this year. We found the apartment to be so spacious, clean and had everything we wanted. The location is amazing, great pools in the complex, beach & promenade right outside the gate. There are numerous playgrounds within a few minutes walk. All the restaurants again were so close and were so welcoming to the kids. Loads to do in the area, did a boat trip to see dolphins and hired bikes along the promenade. Richard the owner was really nice and friendly. Overall I would highly recommend this apartment. Hi Deirdre, it was great to have you back again this year and for two weeks this time, I'm glad the kids enjoyed themselves and you enjoyed the new sunroom which you found very relaxing in the evenings. And thanks again for your lovely reviews. Just back from our beautiful week away in January. This was our first family holiday as we have a small baby and we were quite nervous. But on arrival our nerves vanished. 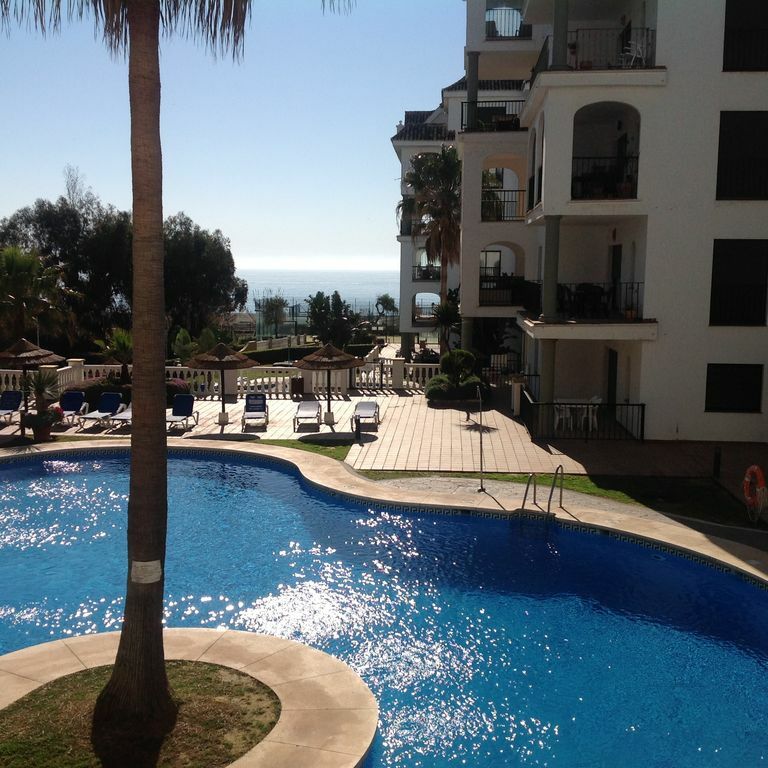 It is a lovely apartment in a big complex with 4 swimming pools, a games room, overlooking the beach (entrance to the beach from the complex) and only a 2 min walk to the beautiful marina where there is an abundance of bars, restaurants and shops with plenty to do. We had a week of good weather which helped(16 -18 degrees). It wasn't too warm as it was January and we escaped any rain too which was a plus. The apartment was just what we wanted. It was very well furnished and had all the amenities we could want including wifi, tv, great kitchen and a lovely balcony for relaxing in the evenings. All in all it was a great holiday and I will definitely be returning this year or next. Thanks Paul I'm glad you enjoyed yourself, it's always pot luck with the weather in January so I'm really happy that your first family holiday went well. Lovely Apartment and a great location! We had a really lovely relaxing week in this apartment with my sister and her husband (2 couples). I've just booked again for September and realised that I hadn't left a review - so here it is! Better late than never - as the adage goes ;-) The owner was very accessible during our last stay - not that there was anything to complain about as everything was just perfect :-) but he was very helpful with information on the amenities and the area as we hadn't been there before. When I mislaid the key one evening and I contacted him in a bit of an embarrassed fluster he could not have been more helpful, He arranged a replacement key for me via his local agent astonishingly fast and saved the day :-) We're all looking forward to returning in September - it can't come quick enough! Many thanks again to the owner and his agent. It's always nice to hear a positive review of your apartment especially when you try your best to make everybody's stay special. I would like to think I go the extra mile when it comes to helping people have a nice holiday. I've always said if you can't make an effort when it comes to renting your holiday home then your heart is not in it. My heart is in it and I'm here for the long stay. This is a great little apartment. Love the complex and the port. Great nite life. Have already booked a second trip. Could not recommend it highly enough. Was a little bit apprehensive about booking a private owners home after some stories I've heard but this apartment more than met our expectations. Myself and my boyfriend went for a week in January just to get away and couldn't fault it. The owner has it lovely and so much more homely than standard hotel apartment. The couch and beds were very comfortable. It was spotless throughout which was very important to me. the motorway is close enough but it is just a road that I didn't find a problem and didn't cause us any problems sleeping. We sat on the balcony every morning and evening and enjoyed cooking dinner in the apartment 2 nights as the facilities were so good in the kitchen. Shower was lovely and constant hot water a definite plus. Owner provided us with perfect directions to get public transport from airport but once we got there, everything is literally within a 5 min walk so unless you are going to a different town, there is no extra expenses of taxis. The beach is literally a minute walk from the apartment door which was lovely for a stroll but we didn't get to make full use of it with the weather not being great. I have just booked to go back over with 3 of my friends for a week in August which I am looking forward to getting full use of the pool and the beach. The port and restaurants and shops are beautiful and it is a fab area to be staying in. Would recommend highly to anyone thinking of heading to that area. Glad you enjoyed your stay, I know January can be a bit of a mixed bag as regards the weather, otherwise you seem to have had a nice relaxing break. So happy you found the apartment to be cosy and modern with all the facilities up to your expectations. Marina Duquesa znajduje się na wybrzeżu z 3 min spacerem do plaży i 5 min spacerem do przystani. Malaga Airport, które jest o 50 minut jazdy w dół nowe autostrady jest obsługiwany przez wszystkich wiodących Companys podróży, Gibraltar Lotnisko jest także w pobliżu o około 20 minut jazdy do Duquesa. Sabinillas, która jest 10 minut spacerem wzdłuż plaży jest dość małe hiszpańskie miasto z dużą liczbą restauracji specjalizujących się w daniach mięsnych Seafood lokalnych i. Estopona jest 15 minut jazdy samochodem, a popularny kurort Porto Banus jest około 25 minut jazdy od hotelu. Jest głównym bankiem w porcie z wielu bankomatów w pobliżu, a zaledwie 3 min w celu Sabinillas daje wybór banków i dużych supermarketów. Booking Notes: A booking deposit of 25% is required and full payment must be made 4 weeks prior to departure. Changeover Day: Change over day can be flexible but Saturdays are preferred. Notes on prices: Prices can be flexible for longer stays.